BabyBlueOnline: Are People Losing Denominational Identity? Are People Losing Denominational Identity? While we hear more quickly these days about seemingly every church tiff no matter how small because of the numerous media outlets and social media, congregations leaving their denominations is nothing new. During the 19th century, Presbyterians split into northern and southern factions over the issue of slavery before the Civil War. More than a century elasped before the two halves reunited. For the 21st century church, a loss of denominational identity has contributed to these separations. Part of that loss comes from the decrease in ethnic ties to certain denominations. “Denominational identity has become less connected to family identity, which means people no longer belong to the same denomination as their parents or grandparents,” says Beal. Turns out we're branches after all. The trend toward innocuous, non-denominational names for churches – even if the congregation belongs to a denomination – also is loosening the national identity of denominations. “Denominational labels are seen as pushing people away and a non-denominational name is seen as more embracing,” says Jacobsen. For many Christians, denominations do not have the same meaning or place in their lives as they did in the 20th century. Thus, when a congregation leaves its denomination, most become non-denominational either permanently or for a time. “You don’t often see one congregation pulling out of one and going immediately into another except perhaps in Presbyterian circles moving from the Presbyterian Church USA to the Presbyterian Church in America, or TEC, which has to be under a bishop’s authority,” says Jacobsen. No matter where the congregation decides to go, the transition out of a denomination can be rocky because of the issues of doctrine, property and worship styles. For Truro, the decision to leave TEC and go into the CANA has not been easy. TEC sued Truro over its property, and Truro has been ensnared in litigation for years, which has taken a toll on the congregation. “It’s been a huge distraction from our ministry and costly for the congregation in terms of time and money,” says Thrasher. This fall, a ruling by the Fairfax Circuit Court on to whom the property belongs is expected. Until then, Truro continues its ministry and hopes for the best. If this (the second sentence which defines) is the definition of schism vs. branch, then certainly Truro is in Schism with Rome, as are most other Protestants who do not accept the authority of the Pope or Roman doctrines. The question, is Truro's case a branch or schism with TEC or the Anglican Communion a different question. Do you have unity of faith? (Define faith. Are you only referring to the creed?) Do you have unity of sacraments? Do you have unity of government? I think I would call it schism with TEC but branch of Anglican Communion - which really makes it TEC the one is schism. If you are interested in a history of branches or schisms I suggest the book Heterodoxy and Orthodoxy by Fr. Andrew Stephen Damick which goes through history and shows how since the great schism each group developed as a response to a previous group. It helps one understand not so much WHAT other churches believe as WHY they believe. Christians can be a fractious lot, without doubt. It is a great shame how centrifugal we tend to be with one another when one senses that God's wish for us is that we be more centripetal around the Trinity. By the way, the chart is fascinating. My first reaction was that some of the lines were in the wrong places, but, on reflection, I understand why they are the way they are. Scout, there was an error on the chart and I understand what you are saying about some lines seeming to be in the wrong places. Alexandria, Jerusalem, Antioch, and Constantinople. 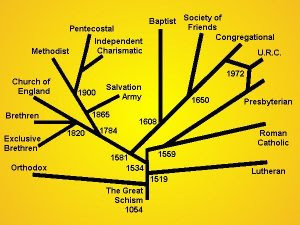 The Great Schism is when the Roman Church, which became known as the Roman Catholic church broke away from the other four churches (which became known as Orthodox). So the base would be early Christianity, or perhaps Orthodox, but certainly not Roman Catholic as the majority of those in the early church would NEVER have identified themselves as Roman Christians. correction you really should make. We are grateful for your helpful e-mail. The diagram has now been amended. the amount of detail that it can show! Thank-you for getting in touch. Wouldn't it be loverly if the diagram looked less like a tree and more like an upside down funnel? The sin of pride makes men think that they know God's mind better than the next man. That's why the diagram looks like a trunk with myriad sprouting branches. The logical end is billions of churches of one, each one believing that he/she knows best what God wants. We are a divisive, disputatious flock. Judgment is mine - says who?